Here are a few albums that will be out in the next couple of weeks. 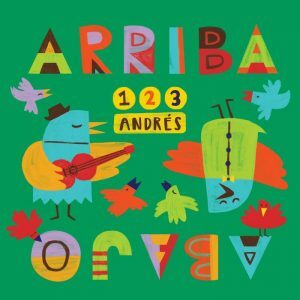 Congrats to 123 Andrés whose second Spanish/English album for little language learners was just nominated for a Latin GRAMMY in the Best Latin Children’s Album category! 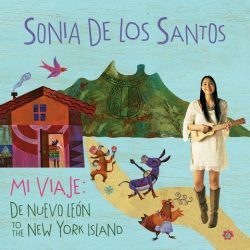 Arriba Abajo is filled with ten songs (first performed in Spanish, then in English) plus a bonus track that kids will enjoy. Take a look at this adorable video for “Dame una A” from the album. 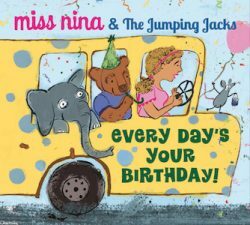 Nina Stone, or Miss Nina as the younger set knows her, returns with her third album for children and first album where she is backed by her band The Jumping Jacks. Stone is a trained dancer and music educator whose passion it is to provide kids and their families the opportunity to enjoy music and dance together and that is evident throughout this twelve song collection. 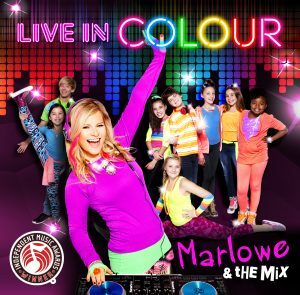 With pop songs like the title track “Every Day’s Your Birthday” which invites lots of interaction and movement by listeners, “My Freeze Dance,” “Up & Down” and “(Silly) Wheels on the Bus” which contains traditional lyrics as well as the addition of soldiers, kangaroos, spaghetti and a dance party on the bus, this album will be a HUGE hit at storytimes or early childhood music classes. 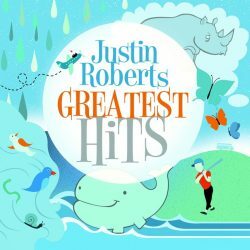 Also included, just in time for those October programs, is a jazzy version of “Five Little Pumpkins.” Additional musical genres set to kid friendly lyrics include the country vibe of “Let’s Go Home” as well as the hip hop tune “DJ in my PJs.” Librarians and teachers will love sharing this album with their youngsters. For more on Miss Nina and to see her weekly video show, visit her YouTube page. 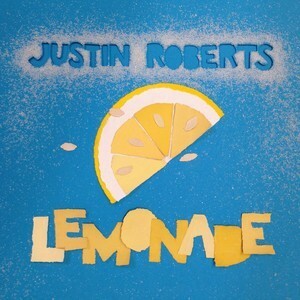 Two time GRAMMY nominee, Justin Roberts, has been thrilling young audiences for almost two decades. 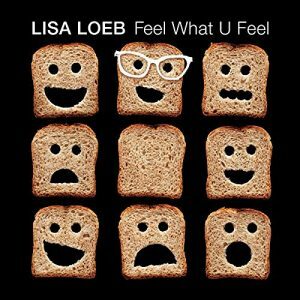 With each album, he’s refined his power pop sound while crafting songs that are both silly yet relatable to young listeners. Whether it’s the child playing baseball who easily gets distracted by all the other things around him in “Pop Fly” or the children in the classroom who are eagerly awaiting that moment when the bell rings for “Recess,” Roberts perfectly captures the way young minds work. Listeners who have younger brothers or sisters will appreciate songs such as “Meltdown” where an older sibling “innocently” borrows the younger brother’s favorite crayon while others may enjoy a sibling puzzling over a younger brother who is “Obsessed by Trucks.” With Halloween quickly approaching, children will also enjoy the building excitement in “Trick or Treat.” If you’re not familiar with Justin Roberts, this album is a great introduction. If you are familiar, but can’t afford the eight albums these 16 original songs come from, this is the perfect way to add him to your collection. 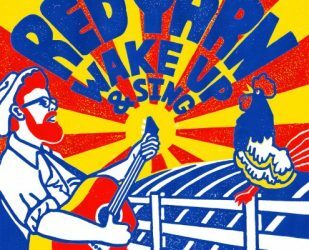 On his third album, Red Yarn proves once again what great music for children and families is coming out of the Pacific Northwest. For this outing Red Yarn, or as he’s commonly known, Andy Furgeson, brings the excitement of his stage show to one of his albums. 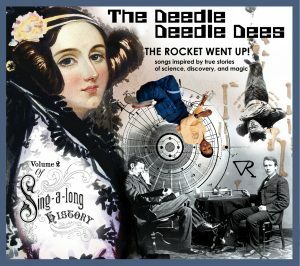 Most of the songs in this collection are infused with an energy that is driven by Furgeson’s skillful way with the guitar and banjo. With a deft hand, Furgeson takes traditional songs such as “Fourth Day of July,” and “Molly Cottontail” and adds a big dose of his own brand of folk-rock. 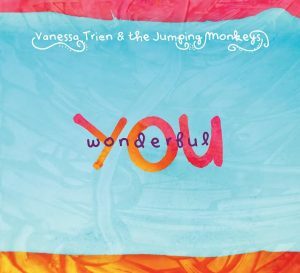 The album opens a little quietly with an original song, “Beautiful Day,” but quickly kicks into high gear with a cover of Woody Guthrie’s “Wake Up.” This is followed by several songs that would work well in storytime including, “If I had a Rooster” which kids will enjoy singing along with, “Clap Your Hands Together” which will get children moving and “Hop Little Squirrel” which will definitely help to get the energy out. Part of the beauty of Red Yarn’s music is the way that he takes songs that were often played for children using basic rhythms and crafts more complex melodies that challenge the young ear while still remaining accessible. It’s this fact that makes this album a great addition to any collection.